Nicoise salad is refreshing and filling, perfect for summer. What is a nicoise salad, you ask? It is a main-dish salad from France made of greens, tomatoes, tuna, anchovies, and usually olives, hard-boiled eggs, and capers. So try a recipe from The Early Show resident chef Bobby Flay. As usual, he offers a few twists. 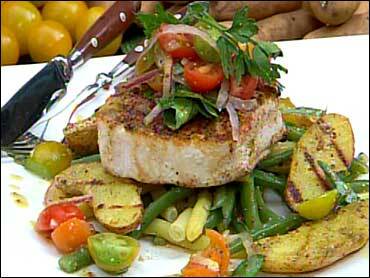 Instead of tuna, he is using swordfish to give it a smoky flavor without being too heavy. And he is adding yellow wax beans. This seasonal ingredient adds great color to the salad. Whisk together vinegar, garlic and anchovy paste and season with salt and pepper. Slowly whisk in the olive oil and set aside. Prepare a large bowl with ice water and set aside. Bring a medium pot of cold water to a boil then season with a tablespoon of salt. Add the beans and cook for approximately 3 minutes or until just crisp tender. Drain and immediately plunge into the ice water to stop the cooking. Let sit in the ice water for a few minutes, and then drain well. Place potatoes in a medium saucepan, cover with cold water and season with 1 tablespoon of salt and cook until almost cooked through (a knife or skewer inserted into the center goes in with a little resistance). Drain well and place on a baking sheet to cool slightly. Once cool enough to handle, slice potatoes lengthwise, brush with olive oil and season with salt and pepper. Place on the grill, cut-side down and cook until golden brown, about 2-3 minutes, turn over and grill until just cooked through, about 1-2 minutes longer. Place cooked beans, grilled potatoes, tomatoes, onions, basil and parsley in a large bowl, add the vinaigrette and gently toss to combine, season with salt and pepper. Cover and let sit at room temperature while you prepare the swordfish. Combine spices in a bowl. Brush both sides of swordfish with oil and season with salt. Rub 1 side of each steak with 1/4 of the spice mixture. Place swordfish on the grill, spice-side down and cook until slightly charred and a crust has formed, about 2-3 minutes. Flip the fish over and continue cooking for 3-4 minutes or until just cooked through. Remove from the grill and let rest 5 minutes. To Serve: Slice swordfish into 1/2-inch thick slices and serve on top of the salad.